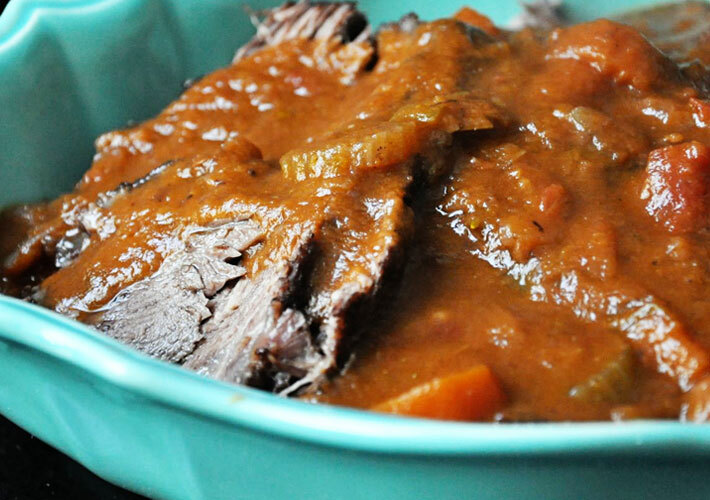 I love making Pot Roast this time of year. It makes the whole house smell amazing and the Bozos love it. I saw this recipe in my new cookbook by the Barefoot Contessa and I've been dying to try it. This isn't necessarily an easy recipe. Not in the sense that it's difficult technique-wise, but it does include a fairly large ingredient list, and contains many steps. This is the type of meal you start when you have a big block of time to spend in the kitchen. But, I think it's worth it for special meals. In my version I've adapted the original recipe slightly. For starters, I didn't add the chicken bouillon cube to the sauce. I'm not a fan of bouillon, unless it's the all-natural variety, because really it's just a small brick of MSG and salt. The roast is cooked with many flavorful vegetables for hours. Everything breaks down and gets infused with flavor, so really I didn't find it needed the bouillon. I also adjusted the quantities of salt. As much as I love Ina's recipes, I find they can be a bit heavy handed with the salt. However, everyone has different tastes...so, just adjust it to suit yours. Finally, the original recipe suggests making a roux at the end, from flour and butter, and stirring that into the finished sauce to help thicken it. I didn't bother with this step, as I thought it was just the right consistency as is. Totally up to you whether you'd like to add that step in. For your reference, you can find the original recipe here. First, prepare the veggies. Chop 2 cups of onions. 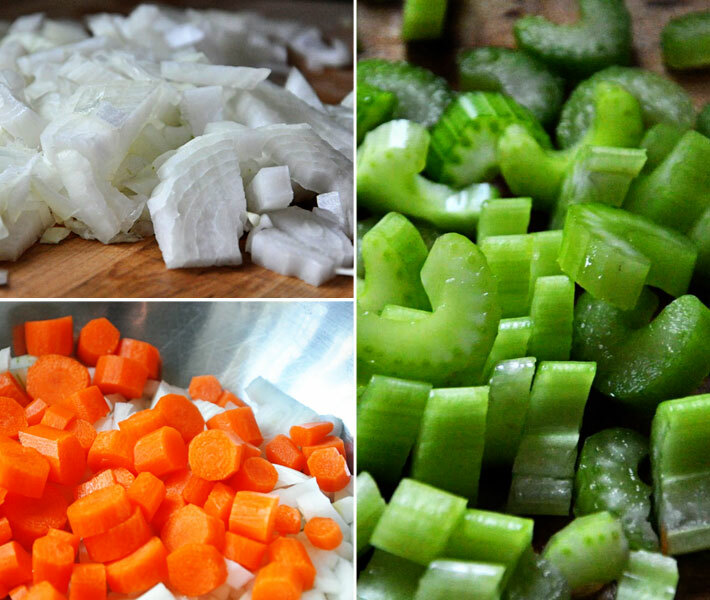 Put them in a mixing bowl and add 2 cups of chopped carrots, 2 cups of chopped celery, and 5 smashed cloves of garlic. 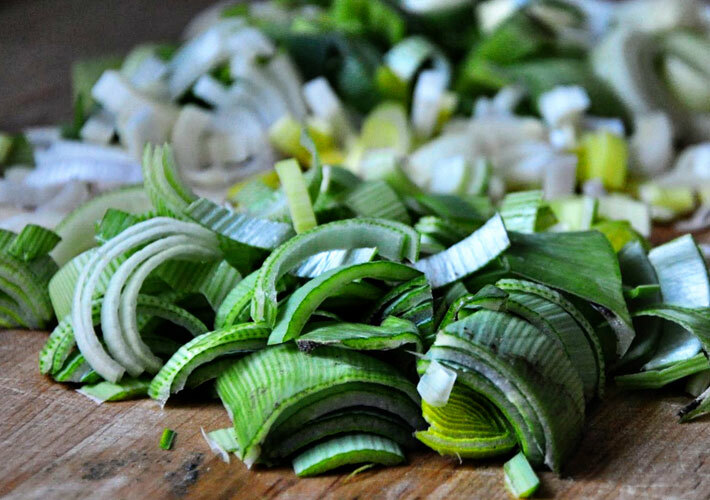 Next, you will need 3-4 leeks. Chop the white and light green parts and rinse well in water to remove any grit. You should have 2 cups. Add them to the bowl and set aside for now. Next, you'll need a 4-5 lb. 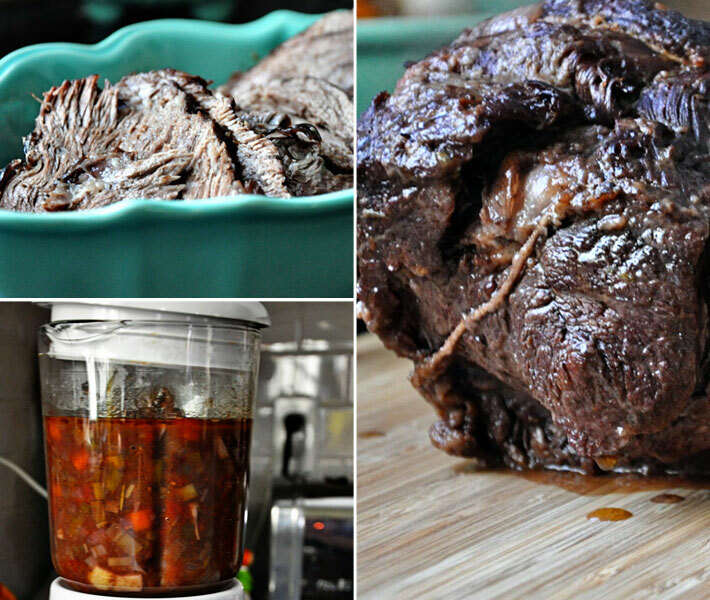 boneless beef chuck roast. I put mine in a large mixing bowl to avoid a giant mess. Pat the roast dry with paper towels and season generously with kosher salt and ground pepper on all sides. Next, roll it in flour until coated on all sides and shake off the excess. Heat 2 tablespoons of olive oil in a large dutch oven, over medium heat. Sear the roast on all sides, for about 4-5 minutes per side. Remove it to a plate. If the pot is dry, you can add another 2 tablespoons of olive oil. Then toss in the chopped veggies and saute for 10 minutes, or until they are tender. 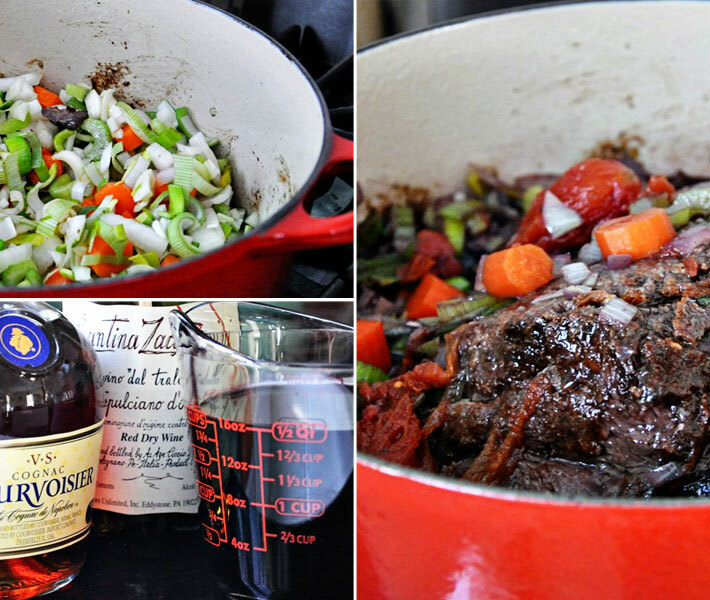 Add 2 cups of red wine and 2 tablespoons of Cognac. Bring to a boil. Tie a few sprigs of fresh thyme and fresh rosemary together with some kitchen twine. Add that to the pot, along with a 28oz. can of whole tomatoes, 1 cup of chicken stock, a teaspoon of salt and some pepper. Stir to combine. Then add the roast back in and bring the liquid back up to a boil. Cover the pot, place in the oven and roast for 1 hour. 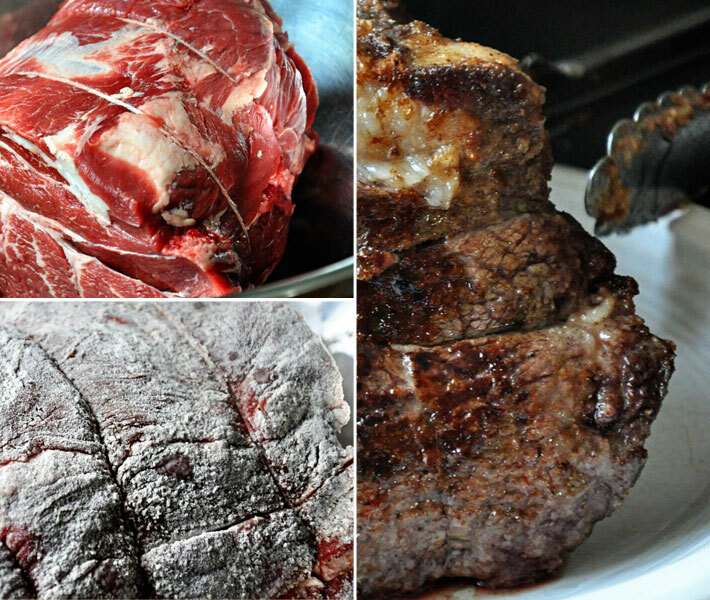 Reduce the oven temperature to 250 degrees and roast for an additional 1 1/2 hours, or until the meat is very tender. and serve with the sauce. This recipe makes a lot of sauce. Much more than you will need. So, it would be a good time to make some mashed potatoes. I've made some minor changes to Ina's original recipe. I skipped making a roux from flour and butter, then adding it to the finished sauce - as I thought the chunky vegetables, only half pureed, did a fine job of getting the sauce just thick enough. I also eliminated adding a chicken bouillon cube to the sauce, as I'm not a fan of using bouillon. Typically, it's loaded with MSG, so I try to avoid using it in my cooking. There are companies out there that make all-natural bouillon, but it's difficult to find them in chicken. This recipe is far from lacking flavor...truthfully, it doesn't need any. Pat the roast dry with paper towels and season generously with kosher salt and freshly ground black pepper. Coat all sides of the roast well with flour and tap off the excess. Heat 2 tablespoons of the olive oil in a large dutch oven over medium heat. Place the roast in the pot and sear for 4-5 minutes, or until well browned. Flip the roast and continue searing for 4-5 minutes per side until all surfaces are nicely browned. Remove from the pot and set aside. Heat another 2 tablespoons of olive oil in the same pot, over medium heat. Add the onions, carrots, celery, garlic and leeks. Season with a teaspoon of kosher salt and a 1/2 teaspoon of freshly ground black pepper. Cook for 10-15 minutes, stirring occasionally, until the vegetables are softened and just beginning to brown. Add the wine and Cognac and bring to a simmer. Tie the herbs together with kitchen twine and add to the pot, along with the tomatoes and chicken stock. Return the roast to the pot and bring back to a boil. Cover the pot, place in the oven and roast for 1 hour. Reduce the oven temperature to 250 degrees and roast for an additional 1 1/2 hours, or until the meat is very tender. Transfer the roast to a cutting board. Remove the herb stems from the pot and skim as much visible fat from the surface as possible. Transfer about half of the liquid and vegetables to a blender, or food processor and puree until smooth. Add the puree back to the pot and stir to combine with the remaining chunky vegetables. Leave the sauce as is, or simmer for several minutes to reduce to desired consistency. Taste for seasoning, and add some kosher salt and black pepper to taste, if desired. Remove the ties from the roast and slice. Arrange the slices on a serving platter and cover with sauce. Serve with extra sauce on the side. Notes: You will have much more sauce than you'll need for the roast. I recommend making a side of creamy mashed potatoes to help use it up!